The heart of group, Namgar (в white cloud from tibetan) whose name was used to call the entire group, grew up in a Buryat family in a tiny village of Kunkur near the border crossing of Russia, Mongolia, and China. Hori Buryat tribes to which Namgar belongs, historically were supporters of Chingis Khan and important commanders of the Mongol Invasion. 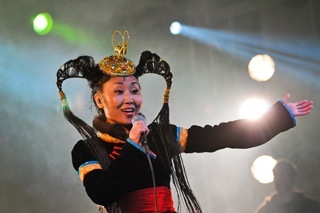 Their songs and dances date back to the glorious times of the Mongolian Empire, preserving many genres and songs that became extinct in the other parts of Mongolian world. Being separated from each other politically since XVII century, Buryats and Mongolians still share many common traditions, and in search of cultural identity often think about each other as "true keepers of the ancient heritage". She is a daughter of the steppe, born to a cattle herder whose line included the darkhasha craftsmen. She masters the mysteries of the great wide open, voices of spirits of mountains and forests. Love to the melodies sung by her granny and her father, the wish to maintain the tradition that is becoming extinct, brought her on festival stages around the world. She sings long songs and yokhor dance tunes, uliger legends of mighty champions, precise arrows, and swift horses, just as they used to sing ages ago, with music arranged so that the jewels of her singing were accessible on world music stage. The repertoire of Namgar consists of the songs and melodies shared by Buryats and Mongolians, embracing the world of sounds as big as from the Lake Baikal in the East of Russia to the Great Wall in China, from the songs of shamanist gatherings of Siberia to celebration songs you might hear at a midsummer fest in Buryatia to exquisite melodies from Inner Mongolia. Looking like characters from the ancient legends of Asia on stage, the group delivers the music that is both exotic and easily accessible. Worldmusic Band Line-up Extremely exotic fusion of buryat-mongolian tradition and modern rock/electronic/jazz elements: Right in the city center, you turn around the corner and see a yurt in the midst of grassland under the bottomless blue sky, with spirit voices of mountains and forests haunting you.